BEACON FALLS ? 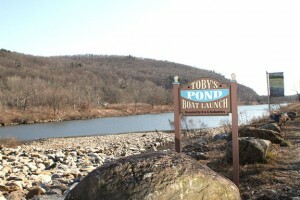 The town is working with O&G Industries to make major improvements to Toby?s Pond this spring. ?It?s a major project. It?s going to be redesigned and there?s going to be some walls built, bridges rebuilt, the beach is being relocated, the floodplain is being regarded,? First Selectman Gerard Smith said. The Board of Selectmen appointed Rich Minnick to oversee the project and act as the town?s liaison between various groups involved in the work. ?He?s going to be the point of contact between O&G, the town, volunteers, and the different civic organizations in town to finish the park,? Smith said. O&G deeded the pond to Beacon Falls in 2009 as part of a deal with the state Department of Environmental Protection. Before it became Toby?s Pond, the area was a sand and gravel operation for several decades. As part of the deal, O&G converted the area into a recreational park and is responsible for maintaining the barrier between the pond and the river as well as the inlet and outlet spillways to the pond. O&G also provided funds to the town for the upkeep of the area. ?It?s been years now that this has needed to be done,? Minnick said. Beacon Falls has $41,000 set aside for the pond?s maintenance, but Minnick said he hopes to make the improvements for a lot less. ?That location is not meant to be a fiscal drain on the community by any means. ? I still have faith in the public and the people of this town that it can be done with minimal expenses,? Minnick said. ?It?s a beautiful place. It has the potential to be much more beautiful with picnic tables, grills, that kind of thing,? Minnick said. According to the festival?s coordinator, Bob Bradley, a pilot instructor is planning to offer float plane rides off of Toby?s Pond during the event. ?It would be a great way to showcase the town and use the pond for something unique,? Bradley said. Bradley, who is also on the Economic Development Commission, said Toby?s Pond is a great asset. ?We?d all love to see more attention brought to the town through any means,? Bradley said. Minnick is holding a workshop in Town Hall Feb. 22 at 7:30 p.m. for anyone interested in helping develop Toby?s Pond. To volunteer, contact Minnick at rjminnick@snet.net. ?From cub scouts right own up, there?s something that all of them can do,? Minnick said. This entry was posted on Tuesday, February 21st, 2012 at 10:42 am	and is filed under Beacon Falls, News. You can follow any responses to this entry through the RSS 2.0 feed.